SAGE Publishing is pleased to announce Kampton Carter, an 8th grader at Briggs Elementary in Santa Paula, as the champion of the 54thSAGE Ventura County Spelling Bee. Kampton will advance to the Scripps National Spelling Bee in Washington, D.C. in May. Additional top honors were presented to Serena Eaton, a 7th grader at Redwood Middle School in Thousand Oaks who took second place, and Rithik Kompelli, a 5th grader at Oak Hills Elementary in Oak Park who took third. Both SAGE and Corwin take great pride in their local community and were pleased to present the Bee in Ventura County, where their headquarters are based, for the second year in a row. The fit for SAGE to host the Bee was a natural one. “The Bee helps students learn key concepts and develop a thorough understanding of English usage which will serve them all their lives, aligning perfectly with the core SAGE-Corwin belief that education powers societal progress,” says Soules. 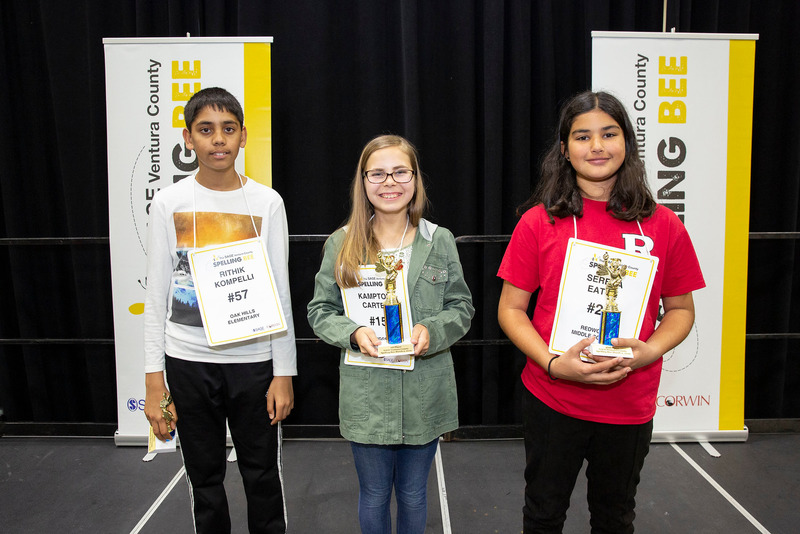 Congratulations to each local winner who competed in the SAGE Ventura County Spelling Bee. We hope that you found the opportunity rewarding albeit challenging. We are proud of all of you and encourage you to continue your educational journey with enthusiasm! For up-to-date information on the Scripps National Spelling Bee and registering for the 2020 Spelling Bee season, please visit www.spellingbee.com.